Hi! 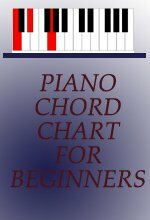 Thanks for visiting our chord piano page on progressions. 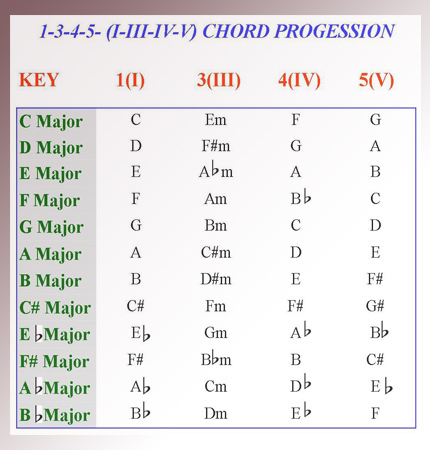 On this page you will learn how to play the 1 3 4 5 chord progression (I - III - IV - V) in all 12 keys on the piano. Progressions are relative chord movements that are use to accompany a particular melody in a song. Before you move any further in this lesson, it is very important that you have basic knowledge of major and minor scales, basic piano chords such as major and minor chords, and how to play the 1 4 5 progression on your piano. If you have not learnt about the concepts above or want to refresh your memory, then click any topic of your choice below. Constructing and playing major scales on the piano. Constructing and playing minor scales on the piano. Playing the 1 4 5 chord progression on the piano. Once you are able to play the 1 4 5 chord piano movements on your keyboard, then this lesson will be very easy for you. The 1 3 4 5 progression includes three major chords and one minor chord. The 1st chord (root chord), 4th chord and 5th chord are all majors. However, the 3rd chord is a minor. All these chords are formed from a major scale and take the name of the specific degree (note) in the scale on which they were created. Therefore, if you were to play the 1 3 4 5 progression in the key of G major, you would play the following. D major chord (Dmaj) = 5th chord. Take a look at the illustration below for clarification. Please bear in mind that it takes more than one chord progression to play most songs. Therefore, your main objective in this lesson is to learn to play this progression in all keys on the piano. Then, apply them in appropriate songs in which I III IV V chord movements are used. The 1 3 4 5 chord progression is easy to play on the piano. Below is a chart with illustrations showing how to play this type of progression in all 12 keys on the piano. Please visit the chord chart page to assist you with the chords above. I am sure that you have found the chart above to be very useful. Please make every effort to practice them during your spare time. 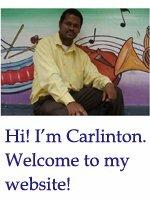 Leave the chord piano progression page and return to home page.